IOS App Developer: The Topps Company, Inc. This app has no reason to exist. It wants you to pay real money to buy fake card packs consisting of pictures you can just google for free. Honestly, the pictures you’ll find online are better. Trading cards were once fun to collect and actually worth money but you don’t own any physical cards with this thing so it’s just a fancy photo album that you pay for. Waste of time and money if you’re dumb enough to give them any. I have over 25 million tickets and they do not translate to crystals. Kinda crappy because you want me to pay more $$. The only way to truly participate in this app is to pay $$ to buy Topp’s currency (crystals) to buy digital cards. There is a free currency (credits) that you get by logging in each day, but most cards are only available by credits. The free currency doesn’t get you very far. 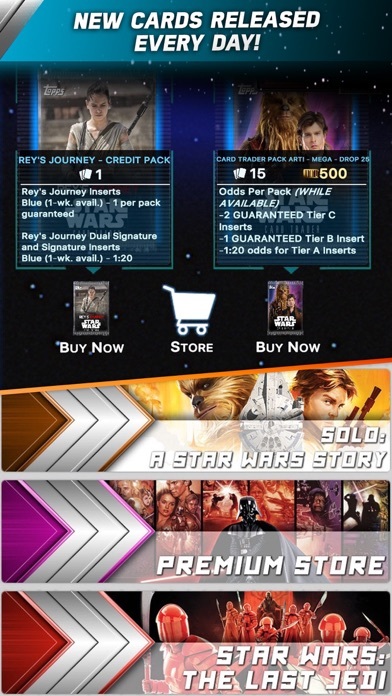 When Topps launches Star War Card Trader 5 years ago before TFA was released, it was a different app all together. 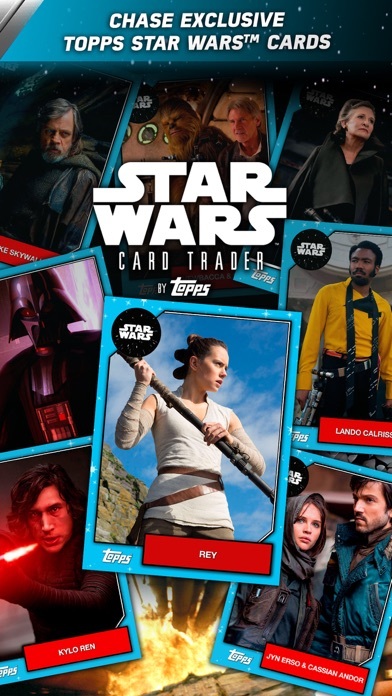 Now, Topps truly just wants your money. Spend your money on something truly collectible and avoid this app. The people at the Topps booth we awesome and are giving out goodies for those who stop in. 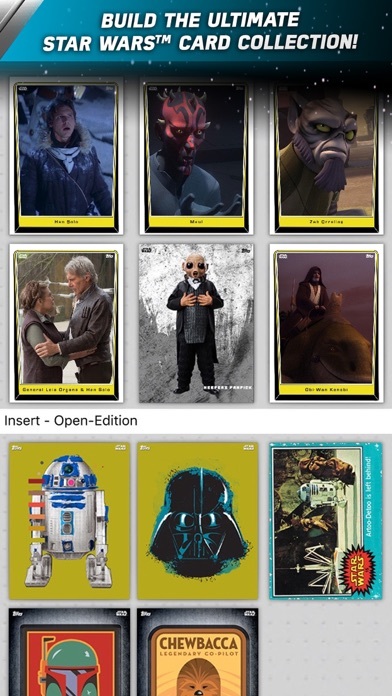 The app is overall smoother than before and it’s nice to see all the cards in one place. Over 64,000 cards in my pocket. The app is expensive to use, but I cherish the worldwide fan base and subculture communities that have become part of my daily life because of this trading card app. 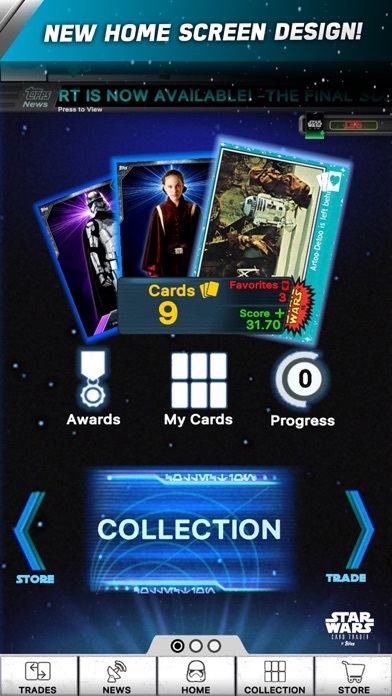 Siri tells me I spend 28 hours a week in SWCT app and I’m okay with that. I regularly trade with players in Portugal, France, Finland, Hungary, and USA. It’s great fun. I remember this app before the dark times. Before the crystals. I was sitting here about to write a long review about how great and fun this app used to be. I was going to write about how condescending it is to call the store where you use your free credits the ‘padawan store’. Like you only matter if you spend money on these awful crystals that make it impossible to have fun and collect cards without. However, what’s the point? Topps isn’t going to change anything as long as people are spending money on crystals for a digital picture for their phone. Have at it! I’m done. I have been suspended for years now and have never been told why. I was always good and clean and spent a little bit of money to collect this neat cards. Then boom! Banned! Can’t do anything now and the app is pointless. Wish I could be unbanned so I could be a part of what once was a great community and app. Now it’s just garbage. Thanks a lot for nothing Topps!!!! 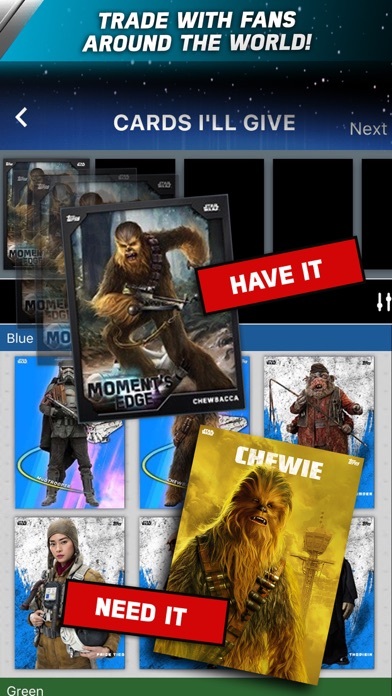 More IOS Apps by The Topps Company, Inc.